Drinking premium, fresh beverages means more flavour in your glass. The variety of flavour profiles across our beers and spirits allow us to pair them with all kinds of delicious foods, and we’re always exploring new sensations. New to pairing drinks with food? Let us guide you on your journey and you’ll be hosting like a pro, in no time. There are three main things to keep in mind when pairing beer with food. Those are the 3 C’s: Cut, Complement and Contrast. This one does just what it says; allows beer to cut through an intense flavour. Opposing intensities such as a rich, creamy cheese with a hoppy, bitter beer work well together, as the bitterness will cut the creaminess from the cheese, making both extremes more approachable. Try Mad Tom with a variety of cheeses, ranging from soft to hard, sweet to tangy, and you’ll see what we mean. This pairing allows similar flavours to complement and add to each other. Got a chocolate stout? Pair it with some chocolate cake. Same goes for that hint of toffee you get from some of our roasted malts, enhancing and complementing a carmelized roast chicken perfectly. Give our Double Chocolate Cranberry Stout a try with some chocolate chip cookies or brownies, and be ready for a mega load of flavour. Opposites attract; this age old rule also applies to beer. Some of our favourite flavour combinations prove this: salty and sweet, sweet and sour, and hoppy and spicy. 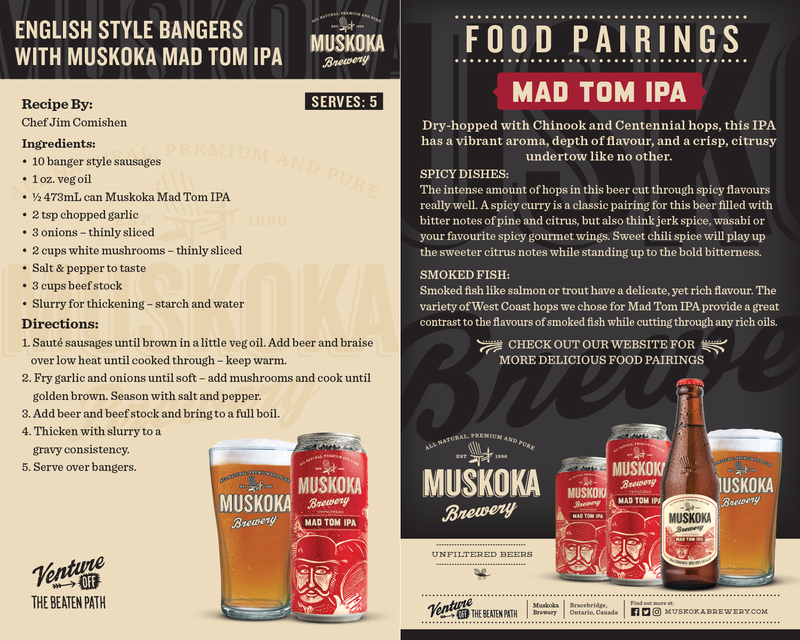 Pair the bitterness of Mad Tom with a spicy curry that can stand up to the intense hop profile. With strong flavour profiles, you want to contrast so neither the beer nor the food gets lost. 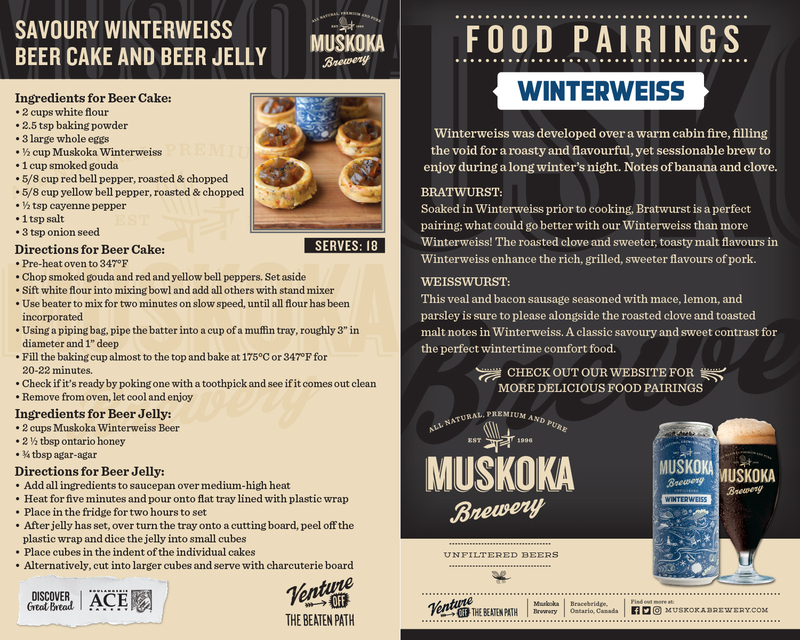 Download a printable version of our food paIrings HERE. Or, browse through each brand’s pairings and recipes below. Unmistakable with its rich amber colour and inviting floral tones, this laid-back, English pub-style ale is smooth and easy-going. Cream Ale’s malty sweetness contrasts with the saltiness from a roasted chicken, while at the same time pairing well with the sweet, caramel-like notes from the roasted skin. A classic pairing, especially for those new pairing food and beer together. Maybe the perfect pairing for Muskoka Cream Ale. The tang of the BBQ sauce contrasts the smooth malt body and floral hop character. Depending on your sauce, you may pick out certain hop profiles, or you may get more of the sweet flavour from the darker malts used in Cream Ale. Montreal smoked meat is the perfect base for Cream Ale. This juicy meat requires a beer that won’t overpower the distinct smoked meat flavour. Add your favourite mustard to your sandwich, and discover how Cream Ale’s sweetness brings out the sweet mustard flavours. An oily fish, salmon requires a beer that can interact with the delicate flavours. 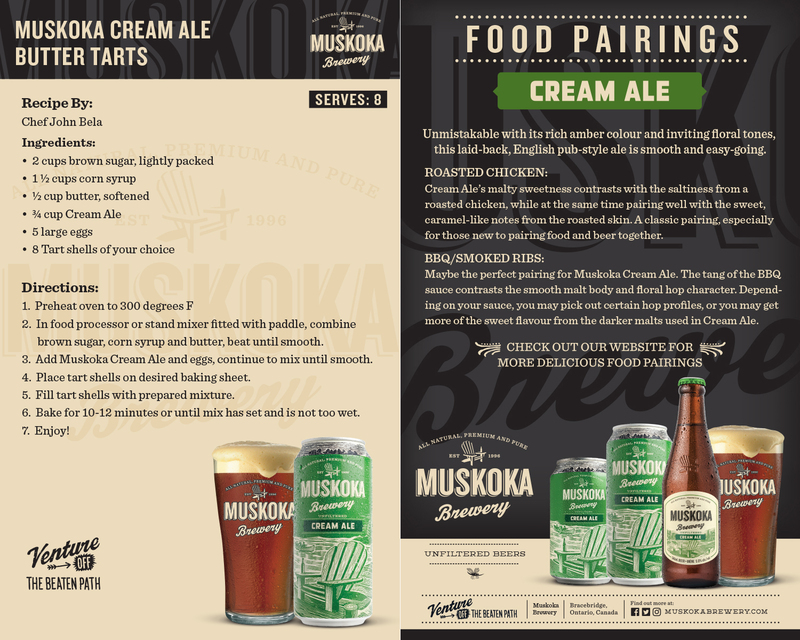 Muskoka Cream Ale is the perfect complement for grilled salmon because the hops cut through the oil, while the sweet malt ties accents the grilled smokey flavour. Handcrafted to be uniquely flavourful, this classic lager is remarkably easy-drinking. Craft Lager’s a great beer to pair with salads; the high carbonation mirrors the garlic-y zip from balsamic and Caesar dressings, while the flavour profile lets different ingredients take centre stage. Try Craft Lager with a goat cheese, pear, and cranberry salad, and see how it cuts through the thick cheese flavour while letting the cranberries and pears stand out. Our humid Canadian summers often call for a refreshing lager, especially when navigating the BBQ. Grilled chicken and Lager complement each other with similarly light characteristics, so one does not overpower the other. Brush the chicken with your favourite BBQ sauce and the malt cereal sweetness will lend a delightful contrast to the smoked tang of the BBQ sauce. Everyone presents fajitas differently, so be creative. Craft Lager’s malty backbone will blend right in with the tortilla and work with everything in between. The sweeter malt balances out the spicy salsa, the carbonation cuts the rich and creamy guacamole and cheese and the light body will quench your thirst, leaving you ready for the next bite. We dry-hopped this lower alcohol IPA, creating a truly sessionable brew with a rewarding aroma, big hop flavours and a clean finish. A fresh garden salad with peach or mango is a perfect match for Detour. Fruit accents bring the tropical fruit notes from Detour’s El Dorado, Citra and Sorachi Ace hops front and center. The fresh bed of lettuce mimics the similarly crisp character of Detour, and a balsamic dressing adds a tangy, yet sweet kick to balance out the hop bitterness. The famously sweet-yet-spicy Thai flavour expertly contrasts our ‘light with a bite’ Detour. The mango in this dish brings out the tropical fruit hops which simultaneously cut through the Thai spice for a well-balanced pairing. Thinly sliced Napa cabbage with grilled, marinated chicken breast will bring balance to a pairing full of flavour. Sweet toasted almonds, crisp wontons, sesame seeds and sweet sesame dressing will combat the bitterness of the hops. Step it up by adding in fresh red bell peppers, green onions and juicy mandarin oranges to play up the hops’ refreshing tropical fruit notes. Shrimp cocktail has some great flavours that you won’t want to over-power. Our refreshing Detour will balance the slightly salty flavours of the shrimp while standing up to the sweet, tangy sauce with its tropical hop power. Citrusy and tart up front, it’s an easy-drinking quencher offering a light-bodied finish. Perfect for those on the go, at just 2.4% this game changer offers a low ABV with a full flavour. Wings and beer? A combination that has stood up to the test of time. These mild-mannered dry rub wings allow the subtle tartness of the light bodied Ebb & Flow to contrast the salt and cut through any lingering pepper spice, cleansing your palate for the next in line. Allow the juicy notes of citrus to take this pairing up a notch and enhance the sweet roasted chicken with bright tropical flavours. Simple and delicious, be sure to test this one out at home or your next local wing night. Seafood and sour beers are a great example of a fan favourite contrast, salty and sour. The subtle acidity of Ebb & Flow cuts perfectly through the briny fish while the citrus character brought forward through Citra hops shines bright, slicing through the rich batter and further enhanced by the complementary lemon slice. Double up on the sour and add some vinegar to your chips for a truly tart combo. This crisp and refreshing session sour is the perfect match to a fresh mixed green salad, chaperoned by avocado, feta cheese and a vinaigrette dressing. This citrus forward sour will cut through rich avocado and salty feta cheese for a beautifully balanced bite. The vinaigrette dressing will complement the tartness of the brew, helping to wash down this delicate dish, preparing you and your palate for your next course. Dry-hopped with Chinook and Centennial hops, this IPA has a vibrant aroma, depth of flavour, and crisp, citrusy undertow like no other. The intense amount of hops in this beer cut through spicy flavours really well. 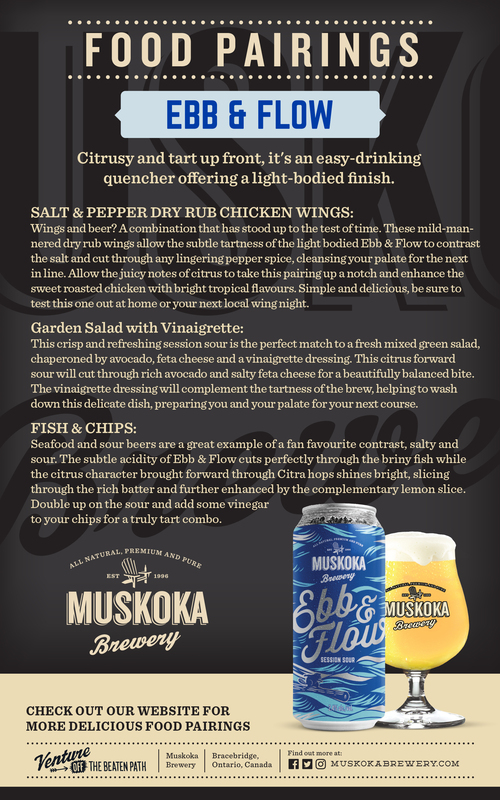 A spicy curry is a classic pairing for this beer filled with bitter notes of pine and citrus, but also think jerk spice, wasabi or your favourite spicy gourmet wings. Sweet chili spice will play up the sweeter citrus notes while standing up to the bold bitterness. Smoked fish like salmon or trout have a delicate, yet rich flavour. The variety of West Coast hops we chose for Mad Tom IPA provide a great contrast to the flavours of smoked fish while cutting through any rich oils. We’ll leave this one to you. Build your favourite burger with some unique and flavourful toppings – bacon, old cheddar, avocado, etc. The hoptitude of Mad Tom IPA will complement some of the stronger flavours, cut through the rich mouthfeel and cleanse your palate between bites. The best of both worlds! An aggressively double dry-hopped Imperial India Pale Ale that delivers a definitive hop aroma and unabashedly big, bold flavor, with a rich smoothness. The big, bold flavor of Twice As Mad pairs well with grilled meats smothered in sweet BBQ sauce. The bitterness of the hops captures the carmelization of the meat, and the higher alcohol accents the sweet flavour in the sauce. The marriage between double IPA’s and Indian cuisine dates back to the late 1700’s, when English brewers would ship beer from England to India for the troops to enjoy. Twice as Mad is no different from its ancestors. The intense hop profile cuts through spicy flavours and accents medium – hot curry chicken or chicken korma extremely well. The roasted sweet flavour from the meat, along with a spicy rub, expertly contrasts the bold flavour of Twice as Mad. Higher alcohol content lends to a sweeter balance of bitterness, but is still strong enough to stand up to the spice for a balanced pairing. Sharp cheddar or strong blue cheese is a great pairing with Twice as Mad. These cheeses have the flavor intensity to hold their own with a double IPA. The salty cheese plays well with the bitterness of the hops, and all of these cheeses leave a creamy, mouth-coating film that the hops and alcohol will clear away. This specialty pale ale is the perfect balance of refreshing cucumber and aromatic lemongrass. A graduate of our Moonlight Kettle Series. This refreshing beer calls for a refreshing California roll. The light crisp cucumber in the pale ale brings out the rich salty-sweet and earthy flavours in the roll, while the cucumber in the rolls complements the fresh cucumber in Cool as Cuke. The slight lemongrass zip plays out nicely with the creamy avocado, creating a meld of crisp and cleansing flavours. 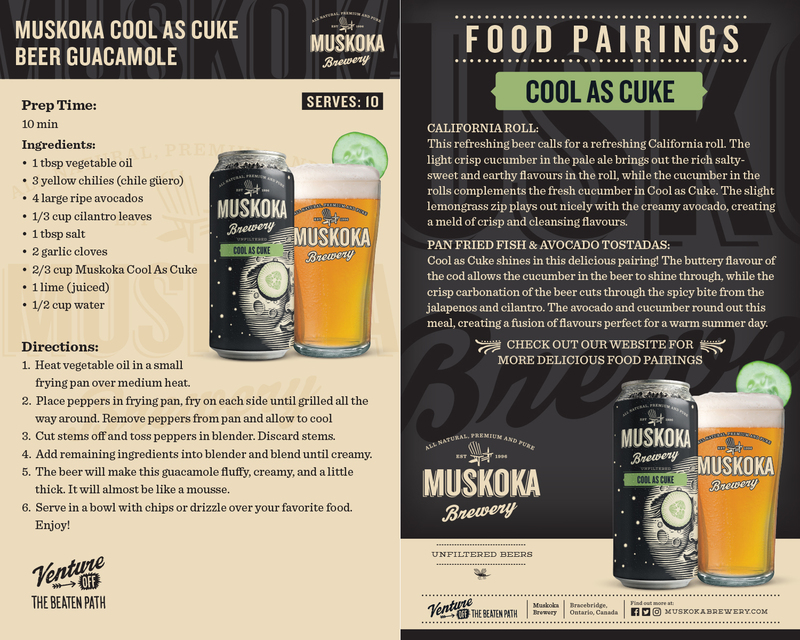 Cool as Cuke shines in this delicious pairing! The buttery flavour of the cod allows the cucumber in the beer to shine through, while the crisp carbonation of the beer cuts through the spicy bite from the jalapenos and cilantro. The avocado and cucumber round out this meal, creating a fusion of flavours perfect for a warm summer day. A bold, hoppy ale with a subtle grassy character reminiscent of the harvest. Curry is a whirlwind of spices and flavours. The complexity of these dishes call for a sturdy beer that can cut through the heat and add flavour to the dish. Harvest Ale acts as an ideal companion with slight caramel malt flavours, and plenty of grassy hop bitterness to cut the spice. The spicier, the better! Not for the faint of heart – this is a bold pairing, but a rewarding one. Blue cheeses need a bold and well-hopped beer to cleanse the palate. Our grassy, hopped Harvest Ale is just the beer to serve with this cheese. The carbonation and lingering bitterness will continue to boldly contrast as the intensity of the cheese increases. With crab cakes you want a beer that won’t be overwhelmed by the sweet flavours of the crab. The match depends upon the spiciness of the crab cake and the sauce. Harvest Ale has a slightly sweet malt flavour and a predominant hop presence that matches the crabmeat, but doesn’t overpower. This is also a great pairing if the sauce has some spice to it. Pesto contains strong olive oil, herbal and nutty flavours, meaning a nice, hoppy ale is a great match to combat these intensities. The full flavour of our Harvest Ale has the hop bitterness to lift and cut through these heavy flavours before overpowering the dish. Brewed with a Belgian style in mind, we added juniper berries, orange zest, and heather tips for a delicious combination of sweet and sharp. Spinach & Artichoke Dip is a mouth-watering combination of creamy veggies and cheese. Legendary Oddity contrasts the distinctive rich and salty flavours from the cheese with a sharp, clove spice of its own. The fresh citrus flavours of the juniper complement the spinach, while the sweeter Belgian candi sugar balances out the artichoke. Legendary Oddity pairs extremely well with the unique flavour of ginger. Our Oddity has two things in common with this fan favourite root; they’re both sharp in flavour, yet balanced by sweetness. The orange and juniper add a sharp citrus zest to measure up to ginger’s kick, and heather tips add a smooth bitterness to balance . Whether you’re adding ginger to a soup, sushi, or pork dish, be sure to try a pint of Oddity alongside. Avocado, lime, and cilantro are a perfect pairing with Legendary Oddity. The crisp, citrusy undertone from the orange peel and hint of sharp juniper berries contrast the sour lime and bold cilantro duo. Rich and creamy guac balances out these strong components for a pairing that’s unique and rewarding! This is a very flexible pairing. Bake or grill your favourite white fish with some lemon, fresh herbs, (rosemary, thyme or dill) and salt and pepper. Legendary Oddity’s Belgian spice enhances the flavours of the herbs to add a unique dynamic. The subtlety of the fish is enhanced with the contrasting spice blend. 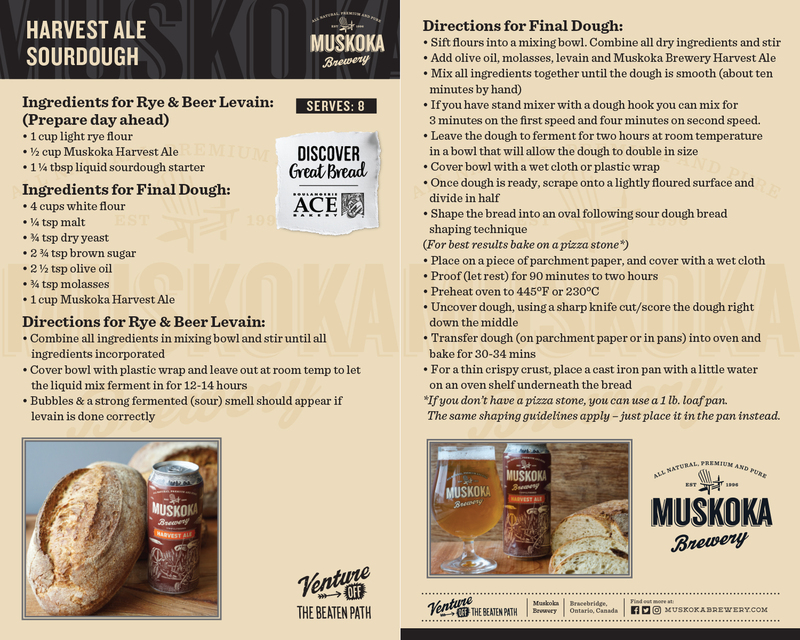 A rich, velvety oatmeal stout infused with Muskoka Roastery’s signature Lumberjack coffee. The cocoa notes in the stout are amplified when accompanied with the rich cocoa of a truffle, while the slight bitterness of dark chocolate is balanced by the velvety smooth mouthfeel. 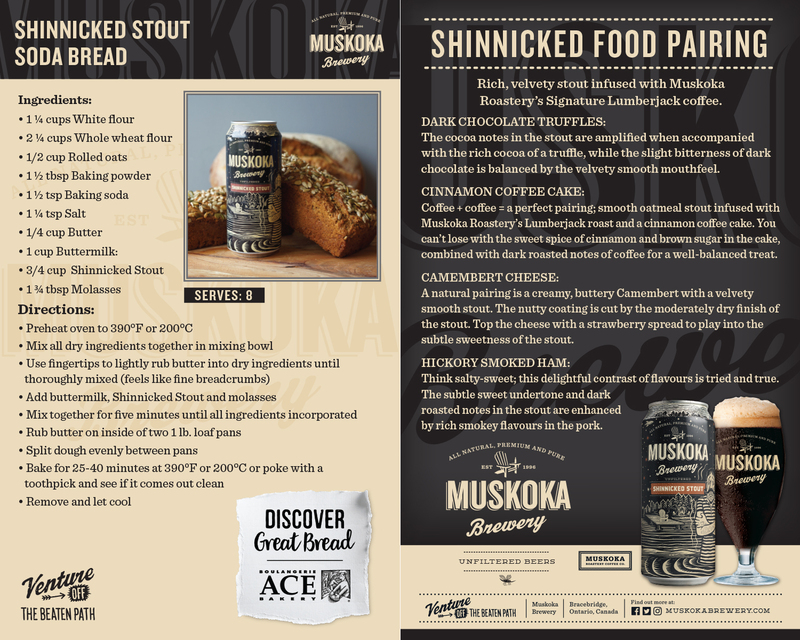 Coffee + coffee = a perfect pairing, just like our smooth oatmeal stout infused with Muskoka Roastery’s Lumberjack roast and a cinnamon coffee cake. You can’t lose with the sweet spice of cinnamon and brown sugar, perfectly complemented with dark roasted notes of coffee for a well-balanced treat. A natural pairing is a creamy, buttery Camembert with a velvety smooth stout. The nutty coating is cut by the moderately dry finish of the stout. Top the cheese with a strawberry spread to play into the subtle sweetness of the stout. Think salty-sweet; this delightful contrast of flavours is tried and true. The subtle sweet undertone and dark roasted notes in the stout are enhanced by rich, smoky flavours in the pork. 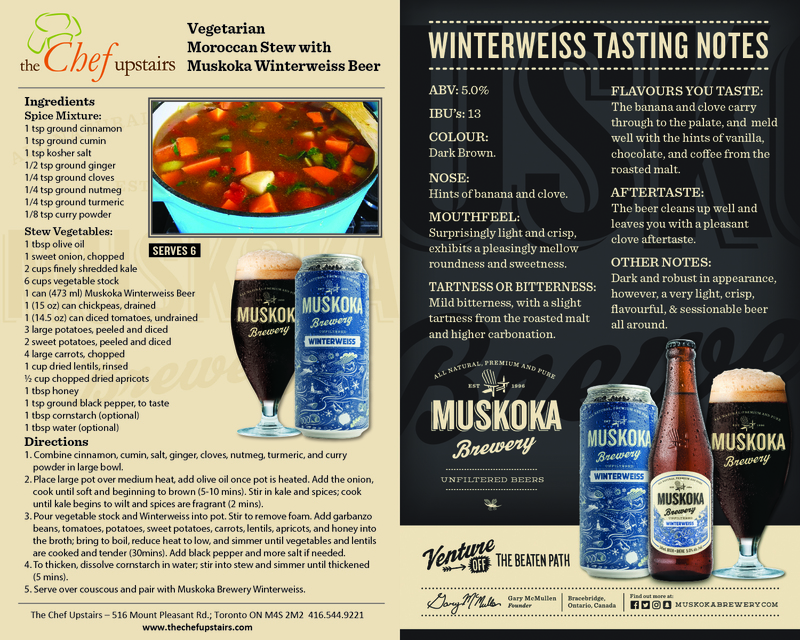 Winterweiss was developed over a warm cabin fire, filling the void for a roasty and flavourful, yet sessionable brew to enjoy during a long winter’s night. Notes of banana and clove. Soaked in Winterweiss prior to cooking, Bratwurst is an perfect pairing; what could go better with our Winterweiss than more Winterweiss! The roasted clove and sweeter, toasty malt flavours in Winterweiss enhance the rich, grilled, sweeter flavours of pork. This veal and bacon sausage seasoned with mace, lemon, and parsley is sure to please alongside the roasted clove and toasted malt notes in Winterweiss. A classic savoury and sweet contrast for the perfect wintertime comfort food. The roasted caramelized flavours from crispy chicken skin enhance the caramel malty sweetness of Winterweiss, reminiscent of a warm toasty banana bread, straight from the oven. The roasted malts in Winterweiss along with hints of clove and banana pair extremely well with a soft-ripened goat cheese or smoked gouda. The sweet tang is complementary, while the effervescent body cleanses the palette. Naturally hazy by design, the perfect balance of passion fruit and mango makes this an aromatic and sessionable wheat beer. A crisp and refreshing wheat beer with bursts of tropical fruit perfectly complement the light, grilled chicken and juicy pineapple. The goat cheese is delicate, but it’s tart, earthly flavour stands up to the passion fruit and mango that shines through in Summerweiss. The thick crustiness of the ciabatta bun complements the heavier mouth feel from the wheat, but feel free to opt for a sesame bun for a lighter take on this delicious pairing. It’s the perfect meal for a summer evening by the lake! 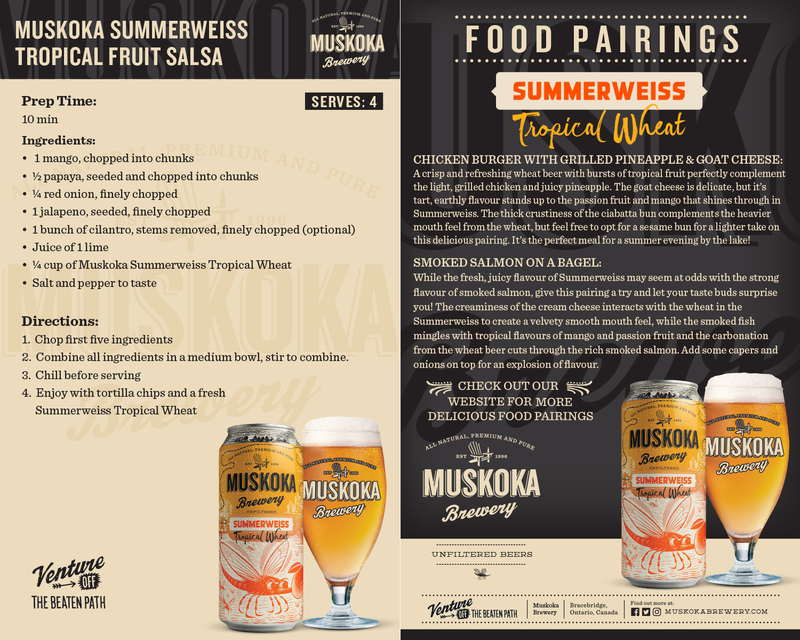 While the fresh, juicy flavour of Summerweiss may seem at odds with the strong flavour of smoked salmon, give this pairing a try and let your taste buds surprise you! The creaminess of the cream cheese interacts with the wheat in the Summerweiss to create a velvety smooth mouth feel, while the smoked fish mingles with tropical flavours of mango and passion fruit and the carbonation from the wheat beer cuts through the rich smoked salmon. Add some capers and onions on top for an explosion of flavour. Our fresh Summerweiss plays up the fresh tasting ingredients of guacamole (cilantro, avocado, lime). The rich avocado base will complement the sweeter wheat body, while cilantro and juicy lime play up mango and passion fruit. A great pairing for the patio on a hot summer day. 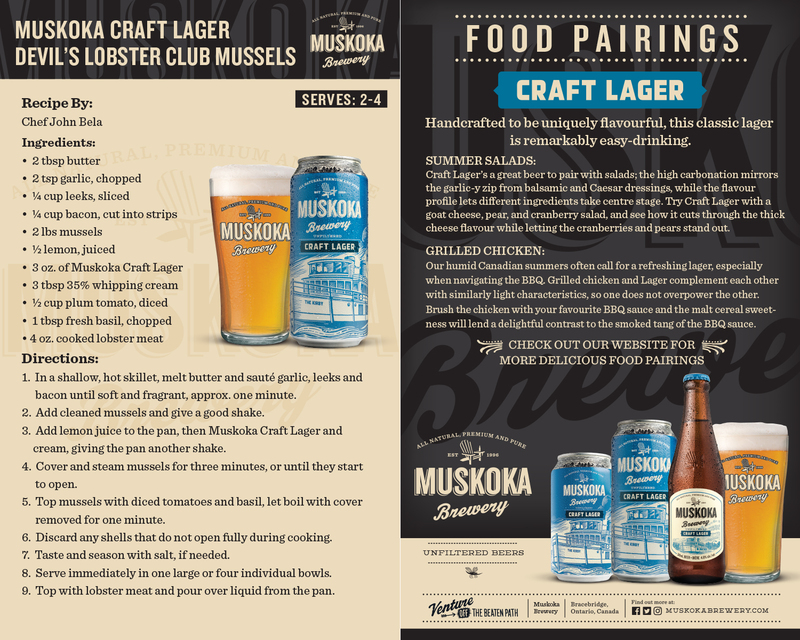 Always a summer favourite, lobster’s sweet, rich flavours are nicely balanced by the bright complexities and tropical notes of our Summerweiss. A healthy dose of hot butter is delightfully cut by the malt backbone. Rich and sturdy with roasted dark chocolate malts, real cocoa, 70% dark chocolate, and freshly harvested local cranberries. Our Double Chocolate Cranberry Stout is a rich and sturdy beer allowing it to complement rich & sweet flavours. The bitterness from the dark chocolate is a beautiful pairing with the cheese and the cranberries are a natural match. Instead of a cup of coffee with your cheesecake, try a serving of our Double Chocolate Cranberry Stout. You’ll be pleasantly surprised! What goes great with chocolate? More chocolate. The dark roasted malt brings out distinct notes in the chocolate and the chocolate evolves the flavours of the beer. It is truly a magical pairing that has a world of possibilities. Pair the beer with fudge, mousse, your favourite chunk of dark chocolate or cake. Each will take on a life of their own when paired with Winter Beard. Go one step further and add in some fresh raspberries, strawberries or cherries. Is this a food pairing? No. Is it one of the best pairings we recommend? Absolutely! Winter Beard is a beautiful beer for a crisp winter’s day. The chocolate adds comfort, the cranberries contribute to the body and the slightly higher alcohol makes it a perfect beer to sip on during a day outdoors.